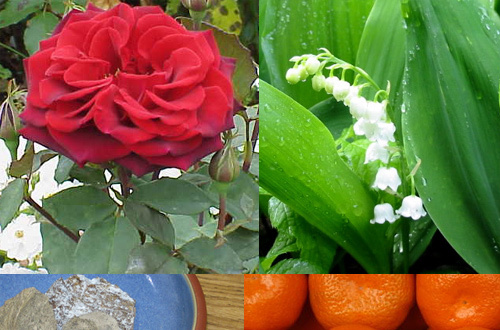 ...Roses from the Dades Valley and refreshing italian mandarins combined with lilly of the valley, white musk and ambergris in a very sweet and sensual oriental flowers. Normally the "very sweet" would make me cautious, and indeed I had requested this based largely on other people's recommendations. Now that I have it on though, it's quite beautiful. 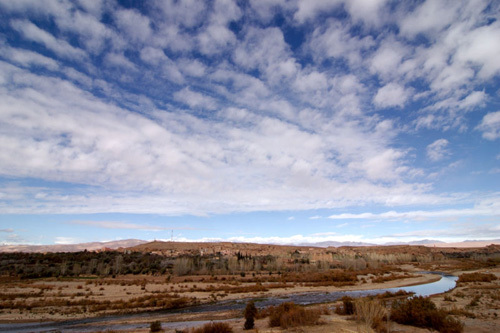 "An oasis in the Dades Valley is responsible for the area's alternative name: the Valley of the Roses. El Kelaa des M'Gouna - the only town of any note in the area - acts as Morocco's rose capital, a vast distilling plant there producing the litres of scented rose-water so popular in the nation's cooking and perfumery. Although El Kelaa smells divine all year round, the best time to visit is in late May, when the rose farmers from the surrounding hills gather to celebrate the year's harvest. With ten tons of petals required to produce a few litres of precious oil, the harvest is understandably a labour of love, and the culminating festivities are all the livelier for it." So this is the essence of Morocco's rose capital? It's fantastic. All along, I've thought of myself as "not a rose person." But these roses are different. They're not tinny and modern; rather, they smell old, exquisite, crimson to deep red. When I first applied Crystal Flowers, the rose sprang out and I thought, eh, another rose scent. Pleasant, but possibly doomed to remain in sample form. After about an hour, the lily-of-the-valley emerged. At first it smelled remarkably similar to the ivy in Diptyque's Eau de Lierre, a sort of bland, almost creamy, mellow greenness. Once it smoothed out though, it began to recall the rose-and-lily-of-the-valley heart of another perfume I own, GF Ferré Lei. It's better than Lei in that the rose is stronger, clearly defined instead of diffuse, but if you like the one, you're sure to like the other. I'm not getting much in the way of mandarins as a discrete note, what I'm getting is a skillful blend of roses that smell like oranges. (Even as a child I observed that good oranges smell like roses and vice versa.) In short it's not exactly "fruity," in the now-generic sense of the word, but there is a twist of orange, whether of the fruit or of roses that smell like it. Sillage: good, even with my cowardly application of only a small quantity from the vial. Lasting power: great. I put this on almost nine hours ago and the rose keeps on going. So far the lasting power seems comparable to their Aoud Roses Petals.